Some men prefer shaving with a traditional men’s safety razor, rather than an electric cordless shaver. And there are others who like to keep both products on hand, so that they can use all solutions for having a smooth clean face every morning. 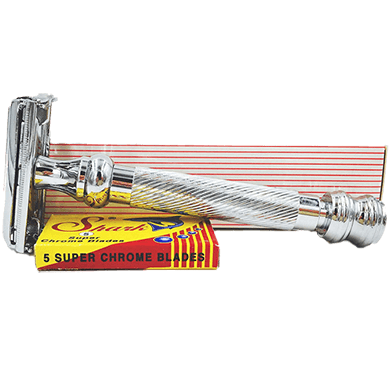 The Parker 99R Long Handle Superweight Butterfly Open Double Edge Safety Razor is a shiny silver metal razor that will be attractive on your bathroom counter. 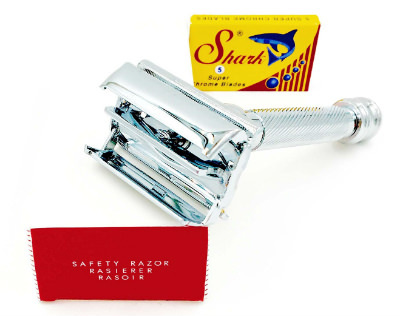 The Shark is made with super chrome razor blades that can be attached and then removed once they go dull. The handle of the razor has a texturized finish to make gripping it easier. At the top of the handle is a decorative knob that matches the rest of its design. 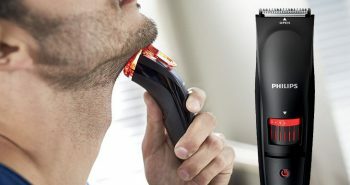 Priced at $32, this is a premium classic men’s shaver but the handle will last you forever. You will only need to replace the actual razor blades. In the kit you’ll get a small package of five razor blades in a small yellow and red box, with a blue shark graphic on the front. This will keep your blades handy until you need them. The razor blade opens up at the bottom so you can easily insert a new blade. Then it snaps closed and you’re ready for shaving. This is called a butterfly open. You can access this feature by twisting the knob at the bottom of the razor. It twists to open up, and then twists closed. The handle is made from solid brass that has been plated with chrome. This is for long-lasting usage and greater durability. The handle measures four inches long. You’ll have a sure grip with the long handle and the texturized finish. This is perfect for shaving even if you have wet hands. The razors included with this product are super sharp. This will give you the closest shave, as well as a comfortable shave. You’ll be able to have a barbershop-like super close shave every day. The Parker 99R Razor weighs 3.4 ounces, so this is not your average lightweight plastic razor. Men will appreciate the heavyweight design which will provide for mindfulness while shaving. You can shave wet or dry, and add your favourite shaving products. Use shaving gels and foams, creams and lotions, or simply soap. 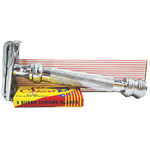 It’s super easy to clean your Parker 99R Long Handle Super Heavyweight Butterfly Open Double Edge Safety Razor afterwards. Simply rinse the safety razor under a warm running tap and shake out the excess water. 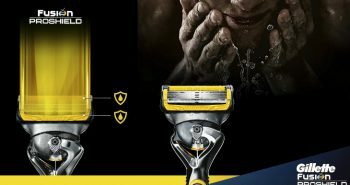 P arker is a well-known manufacturer of men’s safety razors and blades, and they are known worldwide for their products. They’ve been in business for over forty years now. The Parker 99R Razor is a genuine Parker product. 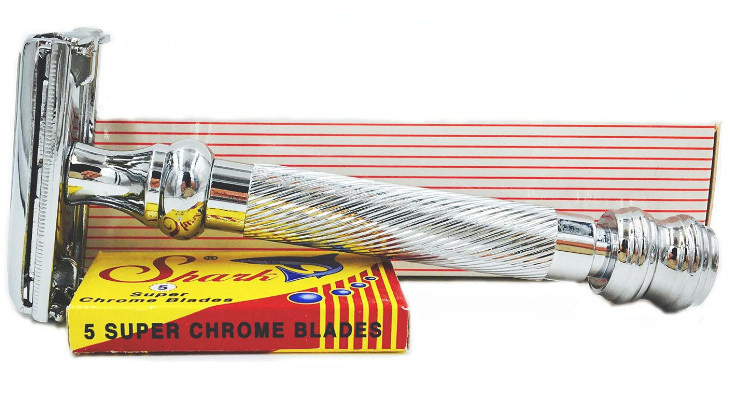 You may have seen other safety razor blades that attempt to copy the Parker product and that are cheaper, but they’re never the same. Stick with your quality Parker products and you’ll never be disappointed. 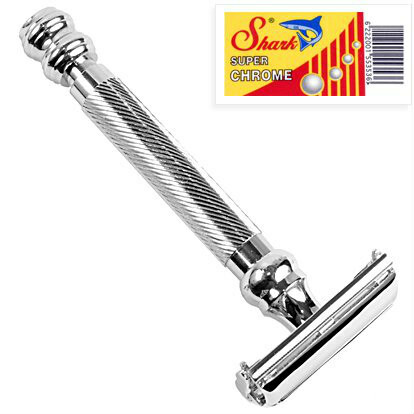 The Parker 99R Long Handle Super Heavyweight Butterfly Open Double Edge Safety Razor handle has been Made in India. In order to get the most out of your Parker 99R, they recommend that you shave with these instructions. You’ll want to let the weight of the razor do all the work for you. Don’t press the razor against your face. For people who are new to safety razor shaving, hold the razor at a perpendicular angle to your face. Once you are confident, you can use a wider angle. Only rinse your razor off to wash it, rather than wiping it dry. You can buy the Parker 99R Razor for yourself, or as a gift. The Parker 99R reviews are excellent, with 4.4 stars out of five. 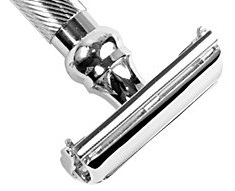 If you enjoy shaving with safety razors but don’t want to settle for the cheap plastic crap from the store, your best solution is to buy the Parker 99R Long Handle Super Heavyweight Butterfly Open Double Edge Safety Razor. 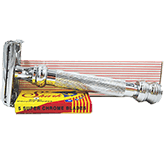 You won’t find any cheap plastic on this safety razor anywhere.